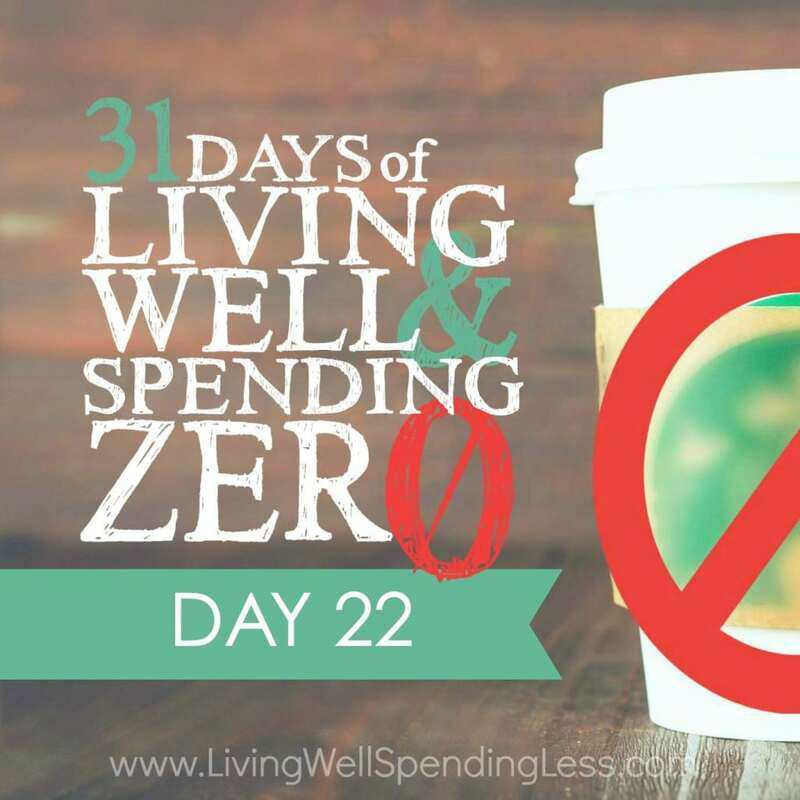 This is the twenty-second day of our 31 Days of Living Well & Spending Zero challenge. Start with Day One here. I have good news! We’ve made it to the final full week of the 31 Days of Living Well and Spending Zero Challenge, and you are rocking it! In Week 1, we focused on taking care of our basic needs (especially because hunger and boredom are the two main causes of mindless spending). In Week 2, we cleaned and organized our homes, learning to enjoy the space we’re in, rather than trying to escape it. Then last week, we started to look at all the things we have in a new light, embracing our creativity and making new things out of old. This week our goal is to capitalize on our resources, both financial and emotional. This week we’re going to learn how to earn some extra money and discover new ways to get free stuff. It’s going to be awesome! After all, just because you’re spending zero doesn’t mean you shouldn’t try to bank even more money and get free stuff while you’re saving! Today we’re going to focus on selling stuff we don’t need. 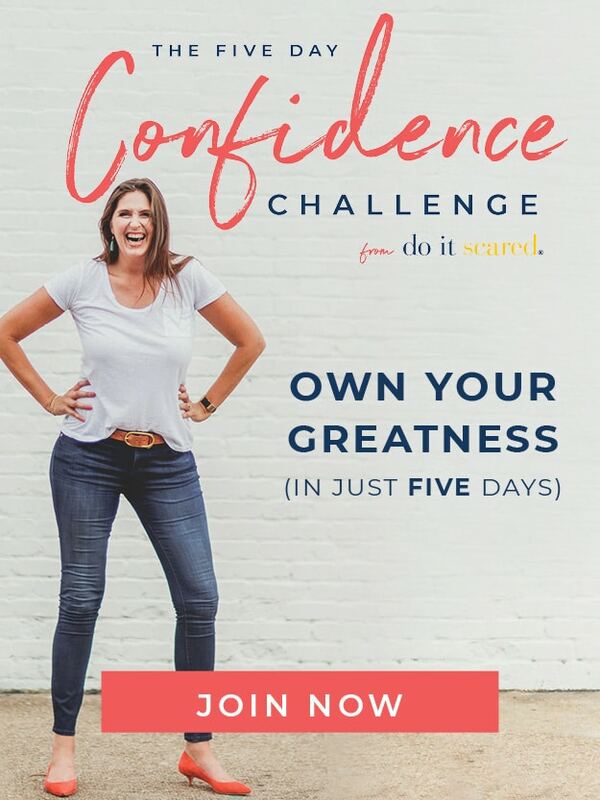 Your first step is to go back to those “Sell” piles and bags of stuff you created in Week 2. (I’ve included a handy Stuff to Sell worksheet at the end of this chapter.) You probably had quite a few things you’d like to offload, but perhaps you weren’t sure where to start or how to sell each type of item. Smart thinking! Different types of items are best sold in different marketplaces. 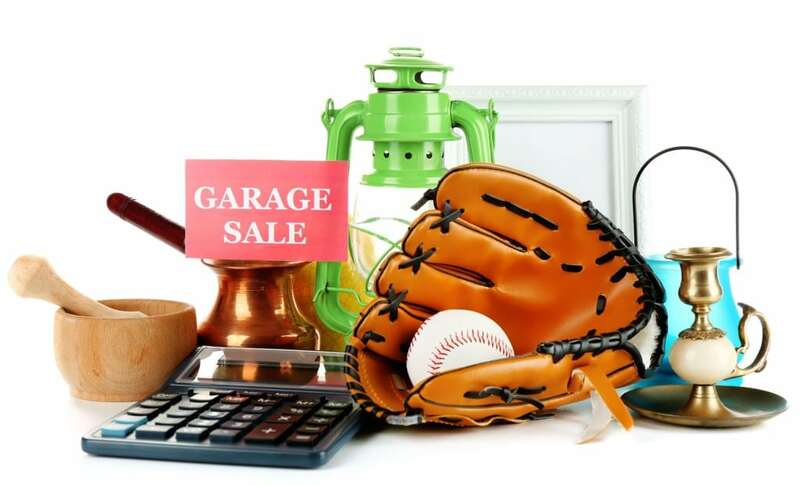 There are plenty of different options available for selling things, from eBay to Craigslist to Facebook—or you can even hold a good old-fashioned garage sale. Over the years, I’ve tried all four of these options with varying degrees of success. In fact, I recently made over $500 in just one month simply by selling stuff I no longer needed! You can too. When to use eBay: eBay is your best bet for selling popular brand-name items (Coach, UGG, etc.) that are in very good or excellent condition, or high-value items that are specialized and hard to find. It can be great for collectable items (think vintage postcards or grandma’s collection of brooches and pins), and unique memorabilia that has a specific target audience like sports memorabilia, breweriana, and souvenirs. It’s free to list items on eBay, but you will have to pay a commission if and when your item sells. Because you’ll most likely need to ship your item, I also recommend planning ahead and considering the size and method of shipping before you list your item. You’re responsible for anything that breaks or doesn’t arrive in the condition promised, so bear that in mind before you box up those porcelain figurines without bubble wrap. Shipping is added to the cost of the item’s bid, but customers can be put off by inflated shipping costs, so calculate carefully. It’s difficult to sell anything on eBay if you haven’t established a reputation. However, it only requires a few experiences of buying, selling, and leaving feedback to boost your rating. If you have many items you’re looking to get rid of that you think are “eBay friendly” (for example, if you just inherited Aunt Irma’s thimble collection), it’s definitely worth establishing a good rating. Take good pictures: For the best shots, use indirect daylight (not bright sun) and no flash! Keep your background pleasant and simple, and be sure to take pictures from every angle. A white or light background works best. If the scale of an item is questionable, try using coins or another common item to establish size. When you photograph, always capture any flaws, dents, or scratches clearly. These often won’t deter buyers as long as you’re honest about them. (Read more about how to take better pictures in “8 Ways to Take Better Pictures,”. Choose the right category for your item and write a good description: Be specific, otherwise potential buyers won’t be able to find your listing! Do a quick search for similar items so you can categorize it properly, then categorize, name, and describe each item clearly. Be sure to mention the brand name in the title, along with the condition. Be as specific as possible; don’t skimp on the details. Surprised buyers will give negative reviews if the item isn’t found to be exactly as described. You should also mention if your item is coming from a pet-free or smoke-free home, and how it has been stored. If you carried a bag for one season or bought shoes for a wedding and only wore them once, mention these details in the description; it will help the buyer gauge the amount of wear and tear that they can expect. Research and use some of the lingo relevant to your item like NWT (new with tags) or NIB (new in box). Consider selling “lots”: If you have clothing that’s in good condition and it’s all the same size, consider selling it in a lot. Title grouped items with the common thread and a description. For example: “girls size 6 play clothes in pastel colors.” This can be a great way to sell items that are popular brands, but not quite designer (like GAP, American Apparel, or even Target). It’s also a great way to sell children’s clothing that’s outgrown but still in good condition. Selling by lot can also be helpful for craft items (like fabric and scrapbook accessories) and small, similar items. Make sure your item fits in the box before listing it: I always keep on hand a few medium- and large-sized USPS flat-rate boxes, which are free from the post office. Always wrap your item well. (Again, you’re responsible for anything that’s damaged in shipping.) The rule of thumb with the post office is that it needs to be able to survive a ten-foot drop or twenty pounds of pressure. Charge the USPS flat rate fee for shipping or calculate cost estimates first: This way there are no questions about shipping and no surprises at the end. If you’re shipping something that’s breakable, add insurance to the shipping price or calculate the cost of shipping it through a UPS “Pack and Ship” service. Answer buyer questions quickly: Once your auction is live, be sure to pay attention to any questions that come up. (Be sure to check your junk folder too!) Answer all questions clearly and honestly right away. If it’s a question about item specifics, post your answer publicly so other potential buyers can see the answers as well. This will also cut down on the time you have to spend answering buyers’ questions via email. Set a “Buy It Now” price: In the early days of eBay, many sellers didn’t set a minimum, so buyers were able to find treasures for cents on the dollar. The market has changed, and now many buyers prefer the option to “Buy It Now” rather than waiting and hedging their bets on a bid. Don’t be afraid to set your minimum price at something that’s low, but reasonable, and set the option for eager patrons to get their item on demand. Although many apps exist to help you manage your eBay account, eBay’s Selling Manager is offered through the site and free to users. I recommend it for the average person. Wait for payment before shipping: Most buyers will pay quickly, but never ship an item until you’ve received your payment! You can easily send an invoice to remind buyers to pay. eBay payments are collected through PayPal, which is a secure site that helps ensure no one gets taken advantage of during the process. You can set up PayPal easily and link it to your checking or savings account so you can transfer the money as you go. Ship your item as soon as possible: As soon as you’re paid, make an effort to ship your item as soon as possible. eBay makes this process very simple: you can actually pay for shipping and print your label at home. If you already have the box, then all you have to do is tape it up, slap on the prepaid label, and let your mail carrier pick it up, or drop it off at the nearest post office! eBay partners with UPS as well, if you prefer it to USPS. Give feedback: Be sure to write a positive note on your buyer’s feedback page. eBay is driven by ratings, and your score is very important to boosting your profile and encouraging buyers to use you in the future. For larger retailers and eBay professionals, the occasional bad review or unhappy customer won’t make or break them. However, reviews can be key for the private seller who is just unloading a few items from home. If you leave positive feedback for your buyer, they will hopefully then return the favor so you can have even more successful sales in the future! If days pass and you haven’t heard from them, it doesn’t hurt to send a follow-up message and request feedback. When to use Craigslist: Whereas eBay is a carefully regulated and secure way to sell your items, Craigslist is much less restricted. It targets a local audience, so it’s a great option for selling items that you wouldn’t want to bother with shipping, including furniture, toys, and other household items. You can find buyers for leftover tile, yard and landscape items, appliances, and more. You won’t get the best price on items with a targeted audience, like collectibles (unless they’re very locale-specific like high school sports memorabilia), but you’ll get a wider audience than you would with a Facebook or yard sale. Think of Craigslist as the “Buy/Sell/Trade” classifieds section of newspapers back in the day. The big appeal to local buyers? Large items like furniture are easy to pick up. Due to the unregulated nature of Craigslist, I’d shy away from selling small valuables, like jewelry or designer handbags. Buyer interaction is often face-to-face, and after a friend relayed to me a particularly harrowing story about picking up a cat tree in a scary situation, I’d advise that you proceed with caution. I always make sure that my husband is home when a buyer picks up an item, and I don’t give out my home address on the first email interaction. Craigslist is free, which makes it an easy way to list your items. It’s definitely more popular in some areas than others—I had way more success selling on Craigslist in the Seattle area than I do in Southwest Florida. Metropolitan areas, cities, and college towns seem to see the most success with Craigslist. It’s very easy to put up a listing though, and there’s no reason not to give it a try! Write a good description: Be sure to mention the brand name in the title, along with the condition and age. Be as specific about the details as possible. You’ll want to include the amount of wear and tear on the item, particularly furniture, and mention if it’s from a smoke-free and pet-free house. In your description, consider mentioning the style such as “mid-century modern” or “art deco,” as well as the materials (laminate, solid oak, etc.). Occasionally buyers will search nearby areas and be willing to travel for the right item that meets their style. Isn’t it more appealing to purchase a “quality contemporary end table with beautiful white laminate finish” than “white end table”? In addition, you should include a message in your listing that all sales are final. Don’t set your price too high: We’d all like to think our stuff is worth close to what we paid for it, but the sad truth is that used stuff isn’t worth all that much. Do a search for your item to find out what other people are asking. If your price is significantly higher, don’t expect any calls. Take into consideration the value of someone picking up the item and moving it themselves, a service which can almost be more valuable than the item. When selling appliances, electronics, and furniture that would otherwise be costly or difficult to dispose or get rid of, offering a lesser price may be worth it. Leave room for bargaining (a common practice on Craigslist), but hold out for the price you want. Be sure to decide on your agreed-upon price before meeting face-to-face. Don’t overlist your item: Follow the Craigslist rules or your post will be flagged and all your listings will be removed. Each region is slightly different, but as a general rule you can post any given item once every seven days. Stay safe: Unfortunately there are some weirdos out there. To be safe, communicate through Craigslist rather than using your personal email. If your item is small, meet in a neutral public location, and if you’re having a buyer come to your house, arrange for someone to be home with you. When to use Facebook: Facebook is free and super easy, so there’s really no reason not to try Facebook first. These days almost every city has a local selling group. Once you join, snap a picture and list a price. (Follow the same selling tips as the Craigslist tips listed above.) If you can’t find a group to join, you may want to ask around to see if any of your local friends have heard of one, or you can simply post your item on your own Facebook wall. If it doesn’t sell you can always try Craigslist or eBay. The obvious drawback is that you’re only appealing to your Facebook friends list or to the members of the selling group. Still, as a free service and a safe, easy method, Facebook couldn’t be simpler. Ask friends to share your listing, especially if you’re in a hurry to sell (if you’re moving, for example). Viral marketing is powerful, and social media can be a great tool to get the word out and find your market. When to throw a garage sale: If you have a lot of stuff to sell and you live in a great neighborhood for garage sales (close to a main street, lots of drive-by traffic, etc. ), then a garage sale might be a good option. If you’re looking to make money quickly, bear in mind, garage sales can take a lot of planning and effort. Craigslist, eBay, and Facebook can be quicker, easier, and faster in terms of simply unloading a few items. However, if you’re ready for a cleanout, a garage sale might be the way to go. Set prices to move and make them clear: Get some tags and mark items to move. Be prepared to make some deals and throw in some extra items to sweeten the deal. Garage sales are often hit heavily in the morning (when the selection is the best) and then start to dwindle down as the day wears on. You can attract shoppers throughout the day by advertising 50 percent off at a set time of day, or try offering 2-for-1 deals to keep things moving. Make sure your prices are clearly marked in large writing. Pick a prime date: Does your neighborhood do a rummage tour? Is the local fair in town and driving traffic through your area? 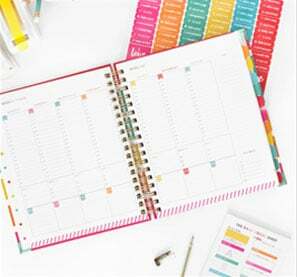 These are great times for you to plan your sale. Base your marketing on the times when your area of town is the most popular. If you live in a college town, consider a sale the weekend that campus opens to attract students seeking furnishings and décor. Use advertising and signage: Put those artistic and creative skills to use by making some big ol’ signs and posting flyers, and if it’s a nice day, put most of your goods outside the garage. Many garage sale patrons are impulse stoppers, so be sure that that they can see you’re offering a great reason to get out of the car. On the day of the sale, start early: Prime rummage sale hours start at 5 a.m. Yes, you read that right. Early-morning bargain hunters get up at the crack of dawn to get the best deals. So make sure you reach dedicated garage sale shoppers by starting your sale bright and early. Donate and eliminate leftovers: When you’ve finished your yard sale, count out your earnings and round up your remaining items. Inventory what you have left and determine whether it realistically belongs in the trash or if you can donate it to Goodwill, a women’s shelter, a preschool, or another charity in your area. 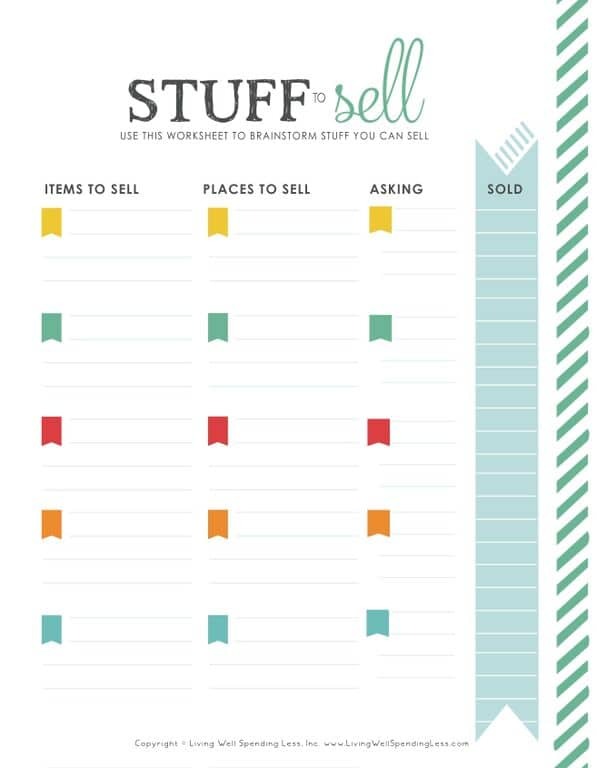 Get your printable stuff to sell worksheet here. I love this post! My family sold almost everything before we moved across the country, and I can vouch for everything explained here. It’s amazing how much money you can make by selling your stuff. I was especially impressed by our eBay sales of old lego sets, action figures, and even some current kids toys. If anyone is on the fence about selling your stuff, just go for it. It feels great to get rid of it, and it feels even better to bring in some money. Good luck on selling your stuff. I’ll warn you now though – it gets a bit addictive. This is great! I’ve been following the challenge religiously and only spent yesterday for hubby’s birthday. 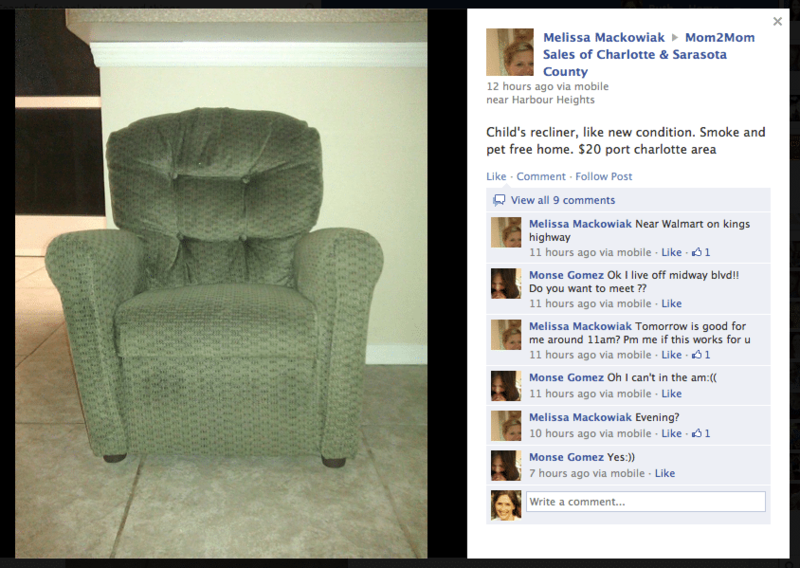 As for my personal experience with selling my stuff… We used to buy a lot and dump it after a while at Goodwill. I started to change that this year though, to the surprise of my husband 🙂 I hosted a garage sale a week ago and did realize that the selling apps I am using to sell my stuff are way better. Someone at the garage sale filled a bucket with shoes, clothes, baby items etc and paid me 15 (and took the bin!) I had too many people at the moment so I said yes, and later regretted it… I sell on 2 apps called mercari and poshmark and just for one of the 5 pairs of shoes that I sold at the garage sale in that bucket I could have made the 15! both sites are amazing but I use them differently. Poshmark is for higher end items, and only women’s clothing, while in mercari you can sell things like your old electronics, as well as men and children’s clothing and pretty much anything. I haven’t had much luck with ebay probably because I don’t have enough transactions to be a trusted seller, but just on poshmark I’ve made over 700 dollars in the past 8 months… if anyone wants to get money to spend for free my codes are: poshmark BMVLD (you get $5) and mercari WBDGXF (you get $2). I have also bought items such as my favorite designer jeans almost new (who wants to pay 200 when you can pay 30?). Only sharing because it truly has helped me get rid of stuff and make money out of nowhere, as well as not pay retail for everything. I really hope this can be helpful for other people! you can also join without codes but you don’t get money to spend… I have two bins in my garage with my “store” and I just check every night to see if something sold. if it did they send you a label to print, you pack it, insert it in your mailbox and you’re done… I don’t have time to go to the post office 🙂 Sorry for the long post, I feel very lucky to be going through with this challenge, I did not think I would last 2 days, and my family was very skeptical, but the crazy thing is that I am actually having anxiety about going back to spending! I never thought I’d ever feel like that! I just brought a bunch of stuff to consignment back in June and just picked up a check for $67. We used that money towards a long-awaited ‘date night’ out (where I also had coupons for the restaurant!) and still had money left over. I then went through closets and drawers again to gather even more stuff (including a designer bag I bought on eBay and never used and will never EVER buy designer anything’.) It’s a great source of passive income and decluttering so…win-win! 1. Sell Your Gold Jewelry. I’ve sold jewelry a few times now and have made over $400. I’d recommend going to a local shop, as opposed to sending something in the mail. If you Google “stores that buy gold” for your area, you should come up with a few options. In my town we have a coin shop, an antique shop, and a jewelry store that all buy back gold. I got $110 for an old high school class ring! My community has three different Facebook groups for selling your things. This can be a good alternative to just posting it where your personal friends will see on Facebook. I love this part of the challenge! I love these suggestions and tips! I guess the only one I would add would be Amazon by Fulfillment. I like that one because they store the items for you and you can send them out to all of the other sites you mentioned. I am enjoying playing this Board game and you this one is most asking and demanding game now a days, so am also inviting everyone with this web address.